The F71 Project watch by HKED is one of several he has undertaken in recent years. The watch comes in three colors as shown below. I was kindly loaned the blue dial version which is the only one of the three which has a date window. The watch arrived Express mail from Hong Kong in a well protected package and the watch itself was nestled in a green box. 4. Looks good and more expensive than it cost. As a week went by taking the watch out for a test drive I realized that this is quite a buy for little money. 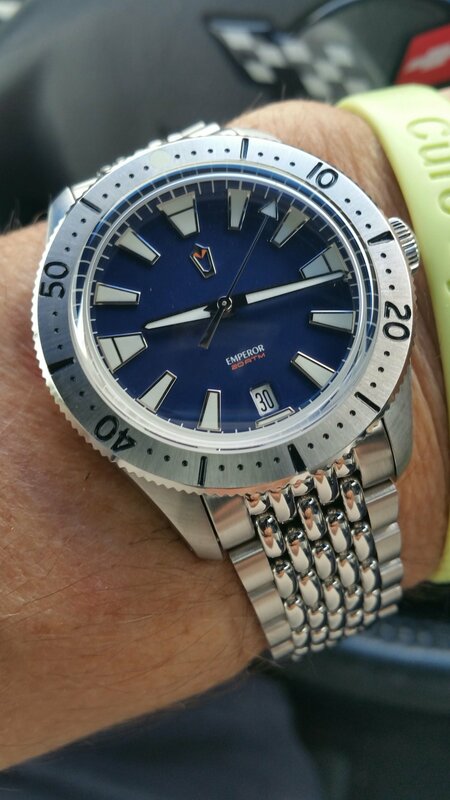 At $350 for this watch, while there are of course other watches out there in similar prices, not many micros offer this kind of value. Although my preferred watch size is between 42-44mm, this watch became a favorite is short order. The curved case sits comfortably on my wrist with no overhang. At 40mm it has enough presence to be seen by the person wearing it but does not overwhelm the wrist as some larger sizes might. It is certainly not a 65mm saucer. The bezel on this version has a solid click sound when rotated and no noticeable movement nor looseness. 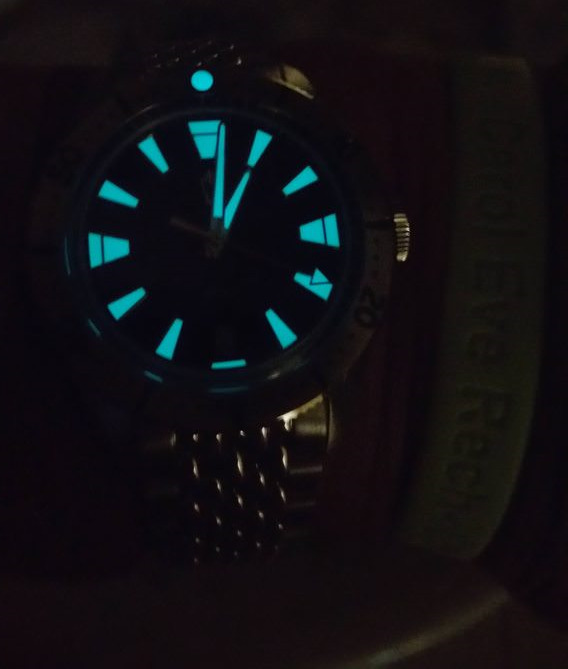 Given that I am almost 70 now it is a bit harder for me to see the lume pip on the bezel but it does not take away from the fact that the bezel does what it is supposed to do and does it well. 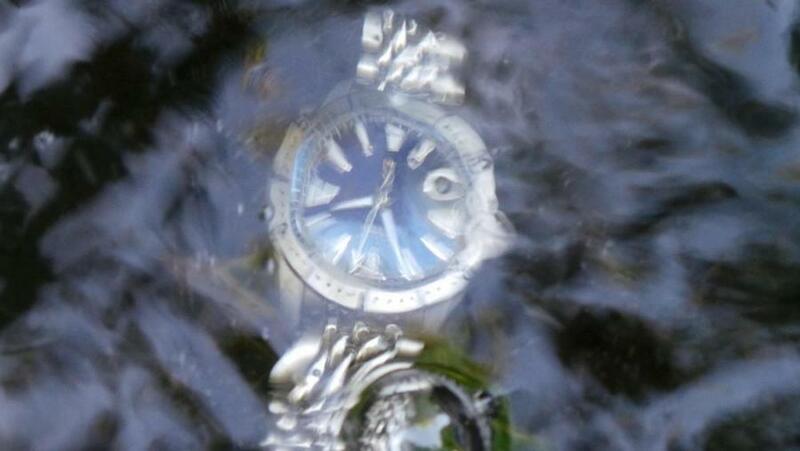 The crown is tight and as some photos will show, did not leak after 30 minutes under water. The crown is easy to pull out once loosened, the hands adjust with ease and the date wheel turns as it should, solid and centered. The watch under the waterfall of the Koi pond where is sat for 30 minutes. Plenty of bracelet unless you have 45" fatboy slim type wrists. I happen to have a fondness for Beads of Rice (BOR) bracelets and this one came with a lot of extra bracelet for even a 10" wrist. This is a very comfortable bracelet and while not everyone likes BOR bracelets, I might suggest giving this one a try for awhile before changing it out for something else. At 20mm in size, some may not wish to invest in other straps but the watch would look good in any strap/bracelet one might choose to wear on it. 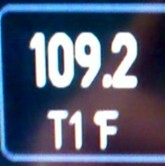 The hour indices are large, easy to see and there is plenty to lume for those who need it or want it. I took the photos after the watch was in the sun for five minutes. 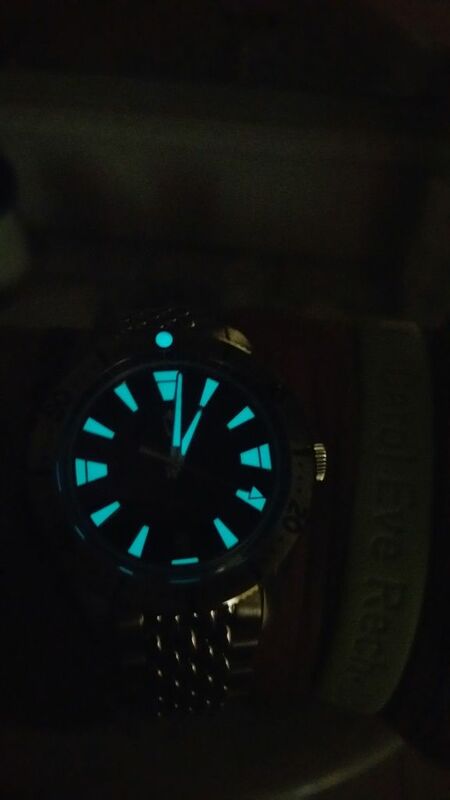 The lume photos were taken after 20 minutes in the dark. Is the watch worth it? Given what you can purchase for $350 these days which in many cases are brands put together from catalogs and marketed in many cases by those with little or no experience in the hobby, yes, well worth it. Some will say that they can purchase a watch from an established brand such as Seiko, Citizen or Hamilton. My response to that is yes, there are decent watches made by the aforementioned brands for similar price points. 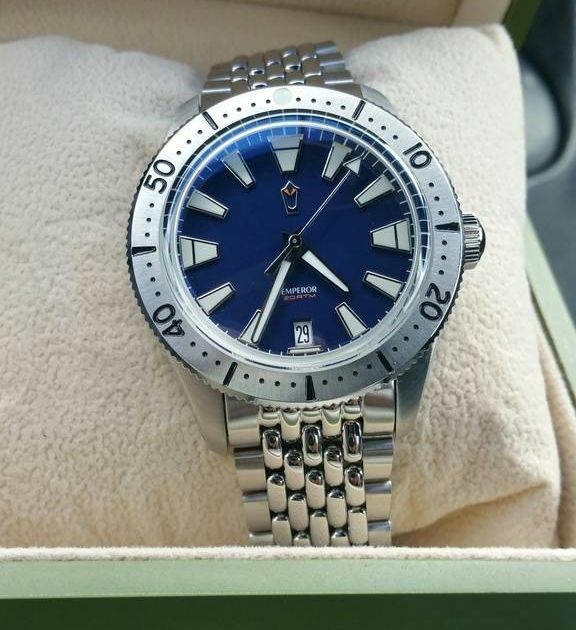 But for the money and coming from a company that has made watches in the past and also manufacturers them for others, I would recommend taking a chance and trying this out. F71, I believe. Excellent review. Nice looking, great size and the bracelet is growing on me. Nice review. 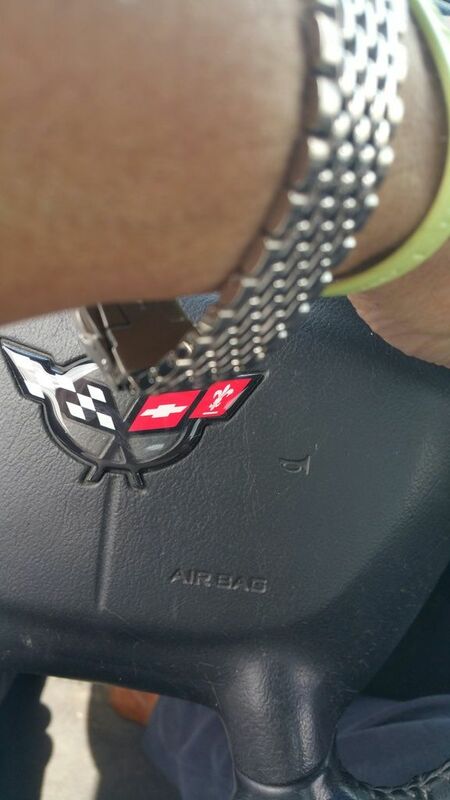 I still can't get past that bracelet though. Great review. It is making me rethink getting one. Fine review! Just when I get my stride breaking micro's balls, something like this comes out, goddamn it. Not really a fan of domed crystals as the dial appears distorted from some angles. Like the dial color and layout though, the date window is a plus. Size is just right. Interesting the description of mechanical measuring device. I thought of that commercial location, location, koi pond. Nice review. Good review, I know you don’t hold back on watch reviews. I’m even more confident in this watch after seeing a review from you. Great review, nice watch. Normally I'd be all grumpy about the date window, but since it's at 6 o'clock, it doesn't grind my gears. ^^ I'll take that deal. It’s not a question about how I can get a Seiko for cheaper. It’s a question of affordable quality, nice looking and 40mm or less. I see lots of nice watches that I would love to have, but they are too big. Ed made a 40mm watch with a vintage inspired dial and case. Most others would have made it a 42mm or bigger watch. Racer-X wrote: ^^ I'll take that deal. Purchased four of these for $106 each delivered from WoW some time ago, gifted three of them. 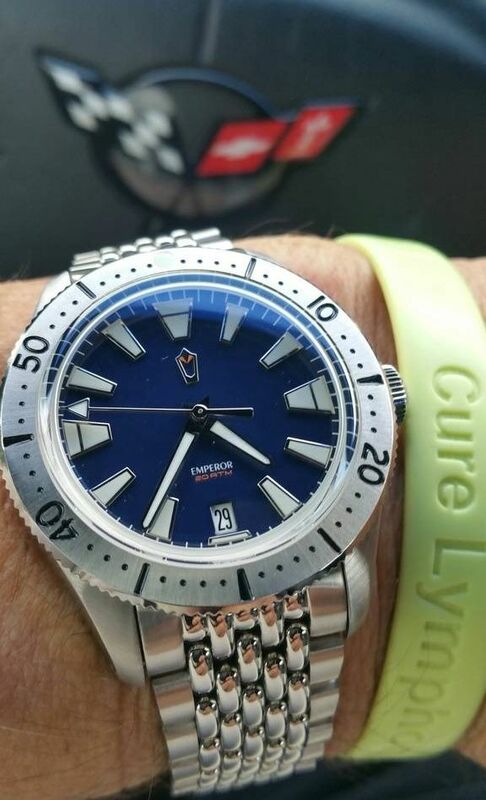 Unsure what benefit you get with the additional $250 difference of the OP watch over the BASM, but enough of me shitting in a sales thread/review. Really enjoyed this review, Alain. MKTheVintageBloke wrote: Great review, nice watch. Normally I'd be all grumpy about the date window, but since it's at 6 o'clock, it doesn't grind my gears. Yup--a date window at 6 doesn't trash the symmetry. It's simple, and simple gets a nod from me. Certainly the watch is worth considering, particularly at a price point that low. I like that - the guy really did a nice job- still recovering from the costs of relocating cross country so I can only dip into my old-man money for, well, nothing. Thanks for taking the time to review. So looking forward to mine. Watches should be here this month. I think you may still be able to pick one up. The nemo is using the same case.